NEW YORK (AP) — Despite scathing reviews from critics, Netflix has greenlit a sequel to "Bright," with star Will Smith and director David Ayer expected to return. The streaming service announced the plans Wednesday, just two weeks after the fantasy police drama debuted. "Bright" is Netflix's first big-budget, tentpole-style release, with estimates that it cost at least $90 million to produce. David Ayer admits making 'Suicide Squad' was "rough and tough". The 49-year-old director lost his confidence as a filmmaker after 'Suicide Squad' was savaged by critics and he found working on such a huge blockbuster wasn't a hugely pleasant experience. He said:" I got some supercharged muscles on 'Suicide Squad', from making a film so big, but it was a rough experience. A tough experience. Gavin O'Connor has signed up to direct 'Suicide Squad 2'. The 52-year-old filmmaker - whose credits include 'The Accountant' and 'Jane Got a Gun' - has stepped up to the job of helming the DC Extended Universe sequel after Jaume Collet-Serra pulled out, according to The Hollywood Reporter. 'Shallows' director Collet-Serra was the frontrunner, but reportedly called it quits to work on 'Jungle Cruise' for Disney, which stars Dwayne Johnson. 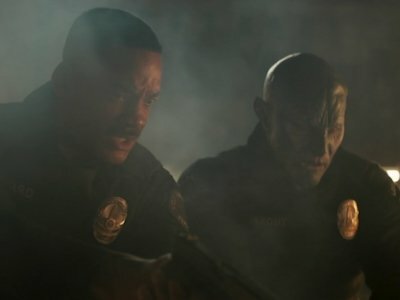 Will Smith has likened his new movie 'Bright' to a fusion of 'Training Day' and 'Lord of the Rings'. The David Ayer-directed fantasy crime movie boasts a star-studded cast that also features the likes of Joel Edgerton and Noomi Rapace - and Will has urged moviegoers to prepare for something special, likening it to two of the most popular films of this century. Summarising 'Bright', Will told Empire magazine: "It's 'Training Day' smashed together with 'Lord Of The Rings'." SAN DIEGO (AP) — Imagine "End of Watch" but with orcs and fairies and magic. That's the vibe of Will Smith's big budget Netflix film "Bright ," which unveiled its first full trailer Thursday in a presentation at Comic-Con. David Ayer has reportedly been dropped as the director of the 'Scarface' remake. The 59-year-old movie-maker - whose previous credits include 'Sabotage', 'Fury', and 'Suicide Squad' - was initially appointed to helm the much-anticipated reboot of the classic gangster movie, but the studio apparently considers his take on the script to be "too dark". 'Scarface' tells the story of the rise and fall of a gangster and has previously spawned two separate movies, made in 1932 and 1983. The supervillain romp "Suicide Squad" shrugged off scathing reviews to open with an estimated $135.1 million in North American ticket sales, scoring one of the year's biggest box-office debuts. LOS ANGELES (AP) — The baddies of "Suicide Squad" are getting pummeled by critics, but they're fighting back at the box office. LOS ANGELES (AP) — When Viola Davis started looking into the role of Amanda Waller, the shadowy government agent who assembles the so-called Suicide Squad in this summer's latest blockbuster, she noticed there were two different versions of the character in the comics. The superhero movie is at a strange crossroads. It generally either takes itself too seriously ("Man of Steel," ''Batman v Superman") or delights in not caring a bit ("Deadpool"). The choice, dear moviegoer, is yours. Do you prefer your costumed heroes to brood or to break bad? Right now, good is out; self-proclaimed "edginess" is in; and a cape might get you turned away from the nightclub.